per CZ-USA's website the SA is now marked discontinued. That bums me out, while not really a competition gun and also with a different slide that made holsters harder to find the SA it's nice pistol. Maybe they didn't sell well? Being a SAO gun, I thought that particular model would have sold well for the competition market at least. It will always be one of my favorite 9mm pistols. ^^Dang. The SA was the one I had my eye on for my first CZ. Colt 1911s, Browning Hi-Powers, other assorted noisemakers. You might want to pick one up then. Classic Firearms still has them. Never made much sense to me to have a SAO competition pistol with a firing pin block. That's not to say it isn't a nice gun, I just wonder if that's why it didn't sell in enough numbers to stay in the lineup. Totally agree. It also seemed odd that the hammer/sear were standard and not that good out of the box. I do like the frame though. I wouldn’t mind having one for a kadet kit host with the lifter removed and new hammer. Would be a great Kadet host. Not getting rid of mine. Not getting rid of mine either.Ive had Hipowers,S$W,Glocks,Sigs this CZ is by far the best (mm Ive ever had.I love the SA.Having said that Im still looking for a Holster. 2 Tango 2 ,what grips are those very nice. I haven't seen one in .40 for a long time. Anyone have a source for one? My 9mm was/is an excellent pistol; the best 9mm I've ever owned in terms of accuracy. I still use the OEM plastic trigger with the little overtravel screw. 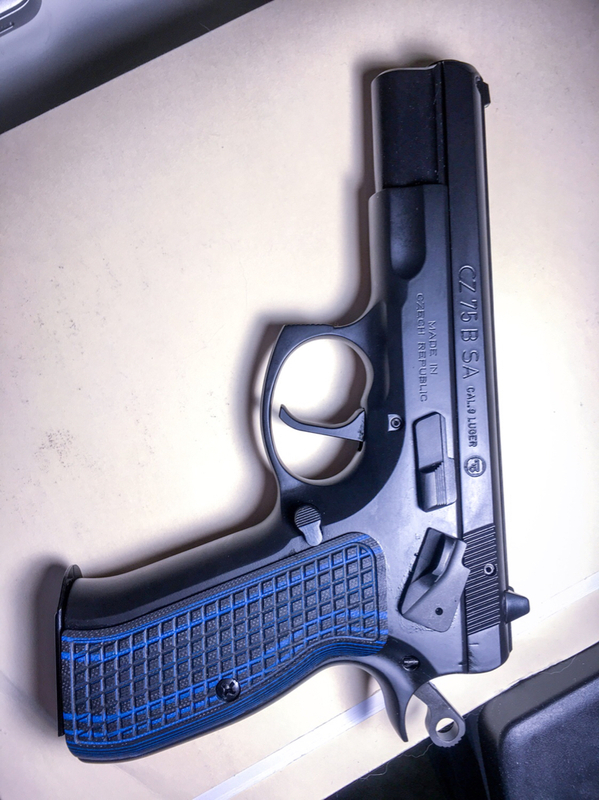 Earlier in the year Stuart had a few .40 cal 75B SA's with a CZC trigger job along with a 9mm conversion barrel....when I bought mine, I don't believe it was the last one, however I don't see it on the CZC website....but you may want to give Stuart a holler....you never know. I went here first and did a price match request. I found another place that had them for $488! But, for the life of me cannot find it now.